This article was written by Jon Krohn. At untapt, all of our models involve Natural Language Processing (NLP) in one way or another. Our algorithms consider the natural, written language of our users’ work experience and, based on real-world decisions that hiring managers have made, we can assign a probability that any given job applicant will be invited to interview for a given job opportunity. are typically far more efficient in production environments than traditional machine learning approaches for NLP. To share my love of deep learning for NLP, I have created five hours of video tutorial content paired with hands-on Jupyter notebooks. 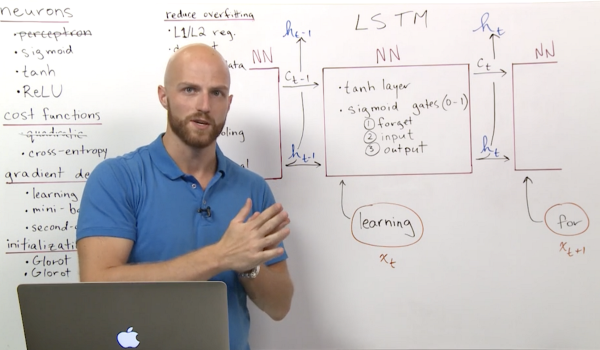 Following on from my acclaimed Deep Learning with TensorFlow LiveLessons, which introduced the fundamentals of artificial neural networks, my Deep Learning for Natural Language Processing LiveLessons similarly embrace interactivity and intuition, enabling you to rapidly develop a specialization in state-of-the-art NLP. improve deep learning model performance by tuning hyperparameters. pair vector-space embedding with the fundamentals of deep learning introduced in my Deep Learning with TensorFlow LiveLessons to build dense and convolutional neural networks for classifying documents by their sentiment. To read the full original article click here. For more deep learning related articles on DSC click here. Classification of documents is a good NLP use case, but this work is moving further away from the goal of acquiring the semantics of documents rather than just "typing" it. This is where ML reach its limit. What if there are documents containing semantics that is totally new. These are common encounters in our everyday life as we need to process new technology, concept, and science. Practical use of ML related NLP work stops as we try to get down to the semantics of each document. After acknowledging this limitation, we have moved away from ML based NLP to develop higher order symbolic calculus that is capable of understanding new and unknown semantics. Another approach we tried is to use symbolic discriminants.